It creates a greater challenge for the middle infielder making the throw to first base. It allows the runner to make a bona fide attempt to reach and remain on the base. It allows the runner to stay in a more direct path to the base, thus preventing the possibility of altering his path and initiating contact. 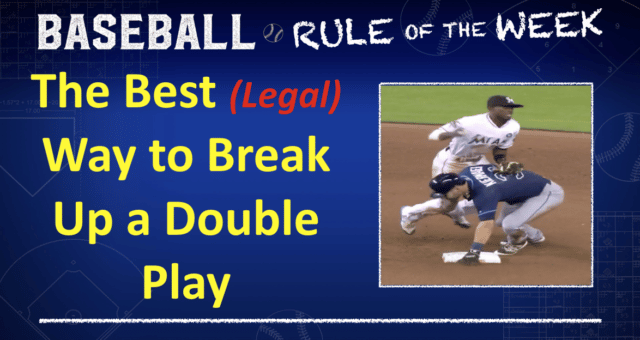 If contact is initiated while making a legal slide, the runner is protected by the rule. Interference is seldom, if ever, called on the pop-up slide. Let’s look at three plays where the pop-up slide proved to be effective. The Rockie s and Reds played at Great American Ballpark on June 7. In the top of the of fourth, the Rockies had Tony Wolters on first and Mike Tauchman on third and one out when Tyler Anderson bunted to first baseman Joey Votto in a suicide squeeze attempt. Votto threw to second base to start the 3-6-3. Shortstop Alex Blandino received the throw for the putout. Wolters ran hard into second base finishing with a pop-up slide causing Blandino to throw wide of first base. Anderson was safe and Tauchman scored from third. It appeared that Blandino’s throwing arm connected with Wolters when he popped-up, but interference was not called on Wolters. Reds interim manager Jim Riggleman challenged Wolters’ slide but the call on the field was confirmed. You can view this play by going to the link below. Game Two of the 2017 Astros-Yankees ALCS series tested the legal slide rule on the final play of the game. In the bottom of the ninth, the score was tied 1-1. The Astros had Jose Altuve at first base with one out when Carlos Correa lashed an Aroldis Chapman fastball into right-center field where it was tracked down by Aaron Judge. Shortstop Didi Gregorius cut the ball off behind second base and fired to the plate, where catcher Gary Sanchez could not handle the short hop as Altuve slid home safely with the winning run. Gregorius’ throw was definitely affected by Correa’s pop-up slide into the base. This is a slide commonly employed by the Astros’ shortstop after he fractured his fibula above his right ankle sliding into third base while playing at Class A Lancaster in 2014. Second base umpire Chris Guccione apparently judged that Correa did not interfere with Gregorius’ ability to complete the play. Yankees’ manager Joe Girardi made the obligatory visit to Guccione but did say after the game that he had no problem with the slide. Park on May 1, 2017. Miami attempted to turn an inning-ending double play, but Kiermaier prevented Dee Gordon from making a throw to first. After Gordon secured the out at second, he didn’t throw to first because of Kiermaier’s slide. When Kiermaier raised up he tried to prevent Gordon from falling. The Marlins challenged that Kiermaier was in violation of Rule 6.01(j), that deals with legal slides. After a review of 2 minutes, 59 seconds, the ruling was confirmed, putting the Rays up, 3-2. Had Miami won the challenge, the play would have resulted in an inning-ending double play, keeping the score tied. All parties agreed the slide was hard and clean. The confusion came as to whether Kiermaier interfered with Dee Gordon‘s ability to throw the ball. The decision allowed the go-ahead run to score, and the Rays went on to defeat the Marlins, 4-2, in the Citrus Series opener at Marlins Park. According to MLB sources, a pop-up slide is legal as long as the runner does not interfere with the fielder’s ability to complete a play. That makes it strictly umpire’s judgment. Contact does not constitute interference if the runner is executing a legal slide. Based on how the pop-up slide has been umpired at second base in DP situations, there is strong precedent that the runner will be protected. The pop-up slide might not be for everyone, but I think there are compelling reasons to explore its benefits.